As we discussed in the previous post, hibernate object has different states those are transient, persistent and detached. 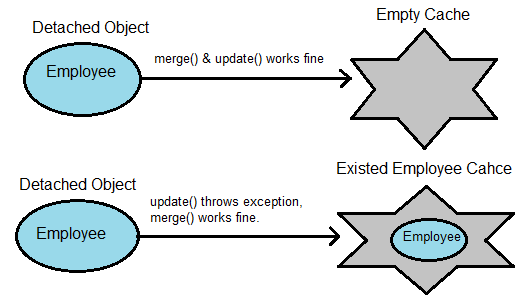 Both the update() and merge() methods are used to change the state of an object. That means we can call either update() or merge() to transfer an object from detached state to persistent state. We can make the detached object to persist by reattching to a session. If the previous session is already been closed, it is also possible to create a new session and attach to that session. To reattach to a session, we can use update() or merge() methods. Both are doing the same functionality, but there are few differences internally. When we call update() method on session, if that session doesn’t contains same object (provided in update()) in cache then update() method successfully executed and the object been converted from detached state to persistent state. When we call update() method on any object, it internally checks, if that object is already existed in session cache or not — if currently updating object is already there in session cache then it throws an exception called NonUniqueObjectException and can not update the object. Take an example of Employee object, has property id, name and age. This example is the empty cache i.e no data exists in a session cache. employee0_.age as age3_0_0_ from Employee employee0_ where employee0_.id=? Hibernate: update employee set name=?, age=?, Where id=? If already existed the same object in the Session cache, then update() method will throw NoUniqueObjectException, example shown in the below. The merge() method functionality is same as update() method. It can work both empty cache and existed cache, it doesn't throw any exception if same object is existed in the cache. The update() method will throw NonUniqueObjectException if same object exists in the session cache, already discussed in the above example. The merge() method copies the current changes into the cache if object is already exists in the session cache. It will update the employee details without exception. Thank you for visiting blog. 1) What are different states of an entity bean in Hibernate? 6) What is the difference between get() and load() methods in Hibernate? Difference between Loose Coupling and Tight Coupling in Java With Examples. How HashMap works internally in Java? copyright @adntechnology. Simple theme. Powered by Blogger.